Dual Language Immersion Registration for 2019-20 5K Kindergarten will begin on February 20, 2019 online only at 4:00 p.m.
​Parent information sessions will be held in late January and February and all information from the meetings and how to register will also be updated online soon HERE. Information regarding the parent information sessions will be sent out via Peachjar and posted on the web. The Office of Standards and Learning at the South Carolina Department of Education is pleased to announce the State Board of Education’s approval for the South Carolina Seal of Biliteracy, an award that recognizes students who have attained a functional level of proficiency in two languages (English and one other language) by graduation. The South Carolina Seal of Biliteracy serves to certify attainment of biliteracy for students, employers, and universities. It is a statement of accomplishment that helps to signal evidence of a student’s readiness for career and college, and for engagement as a global citizen. The Office of Standards and Learning has provided a support document explaining all related guidelines for the South Carolina Seal of Biliteracy, as well as an application that must be used for students to earn the award. STAMP Language testing! ALL immersion students are tested for language language proficiency levels each year. Spring testing begins March 1, 2019. Students applying for the Seal of Biliteracy must test the last year they are taking a language (senior year for most students). District Recognition of Graduating Immersion Students in Lexington One coming this spring! 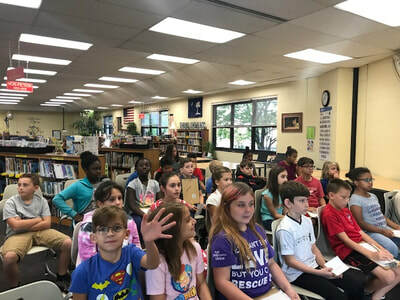 Yenobis Amundaray de Galan, 4th grade teacher at RBES, recently created a collaboration through the program, Skype a Scientist (https://www.skypeascientist.com/). Skype a Scientist matches scientists with classrooms around the world! 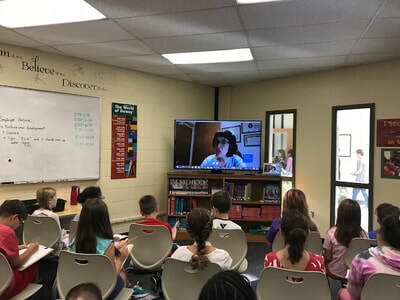 Scientists skype into the classroom for 30-60 minute Q and A sessions that can cover the scientist’s expertise or what it’s like to be a scientist. This was a perfect match for our elementary immersion classroom, since the students are already learning math and science in another language. We also hosted a visit from the Goethe Institute recognizing DES as a PASCH School (Schools: Partners for the Future). The aim of PASCH is to create and strengthen a global network of partner schools with special links to Germany. The entire school participated in a STEM day, including a visit from a famous TV personality from Germany, who is similar to our Bill Nye the Science Guy. Throughout the rest of the day, students participated in STEM activities in their classrooms. MES hosted a French author through the French Embassy in Atlanta. 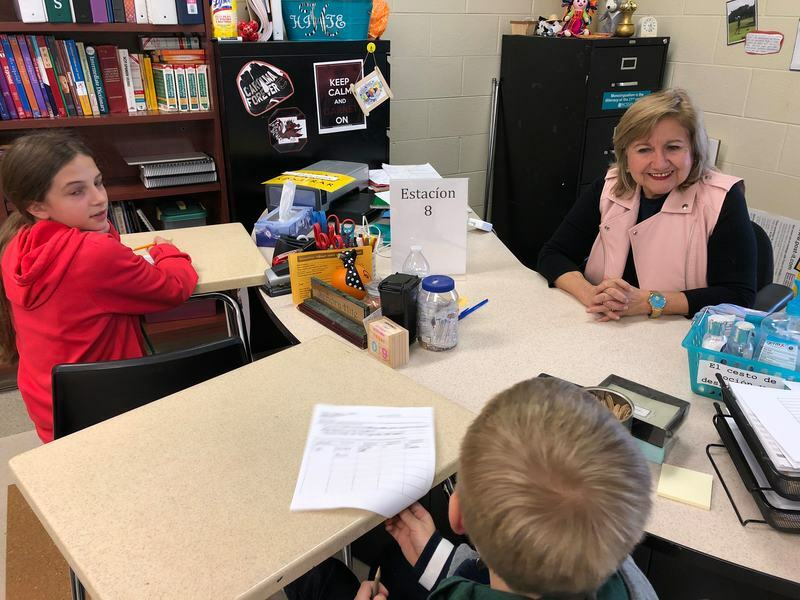 She visited the fourth and fifth grade immersion classes and read them a story she had written. Students received an unillustrated version, which they illustrated themselves, and then read aloud. Neyibeth Gonzalez, 8th grade immersion teacher at PHMS, has created a website for parent communication. This is a fantastic way to stay in communication with parents so they can partner with us in our work with students. Click on the image below to view. 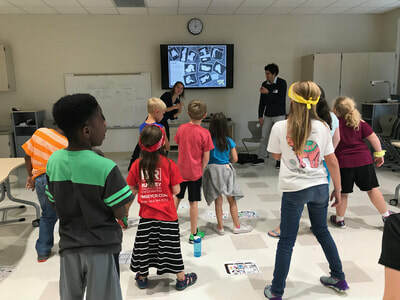 And here are a few moments from her recent classroom activities, which include a presentational speaking activity on a superhero they created for themselves, as well as "Baile Miércoles" (Dance Wednesday) in which students are exposed to songs and dances from Spanish speaking countries. 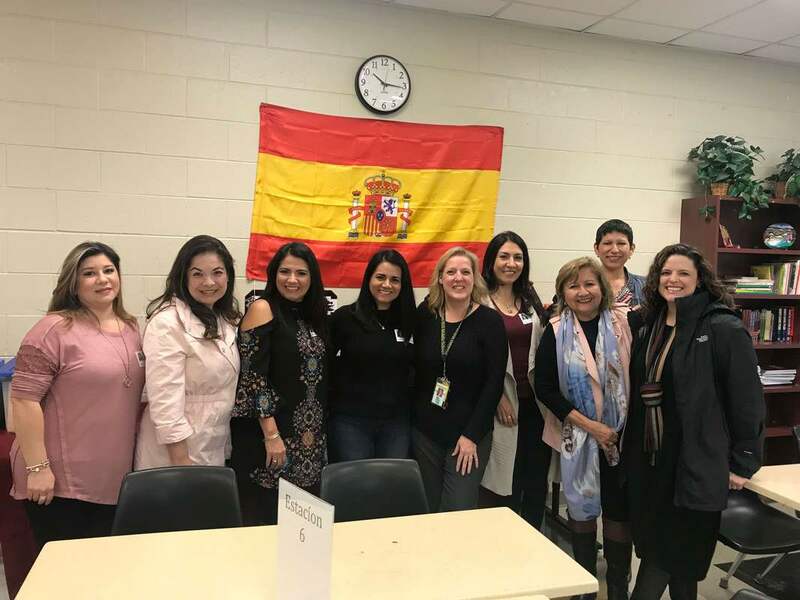 Marci Hite, also from PHMS, organized a visit from native Spanish speakers from the community to help her 6th grade immersion students practice their Spanish conversational skills. One of the volunteers stated, "Sra. Hite....congrats on the great job you did today....WE LOVED IT, and I do believe the students enjoyed it too. After the session, I chatted with some of the volunteers, and they were pleased to see the students speaking Spanish. There were also some emotional questions, questions that made us remember the beauty of our countries, our families, our food, and how we celebrate some holidays." Also in middle school immersion, Dr. Todd Spaulding's 7th grade French immersion students at MGMS, recently finished video game presentations. Dr Spaulding states, "All the students were super motivated. Basically, we learned about the history of video games and certain genres. Then we learned what goes into a video game review (both written and video). The students then chose their favorite video game and wrote up a presentational speaking review of their game." 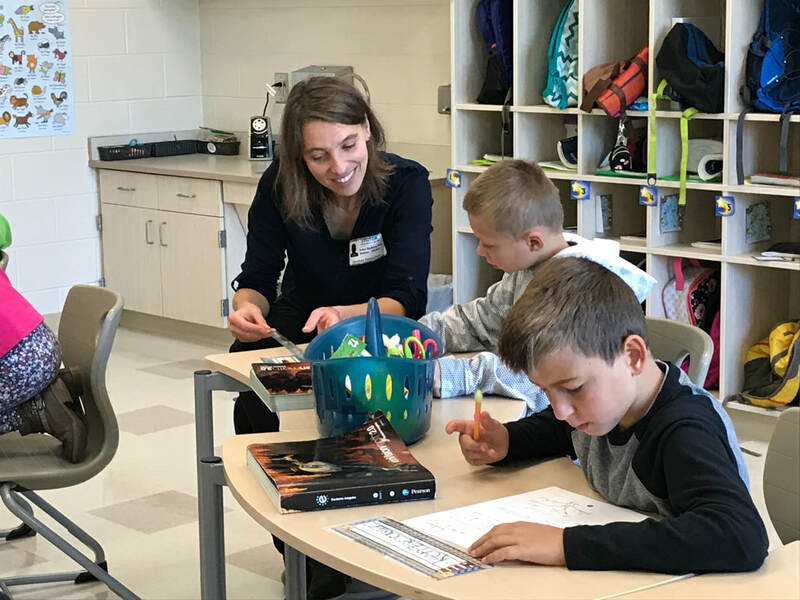 Our teachers clearly strive to connect classroom learning to student interests, while also challenging students to improve their language acquisition. Also, in a connection to the spooky month of October, we they read a Goosebumps book. 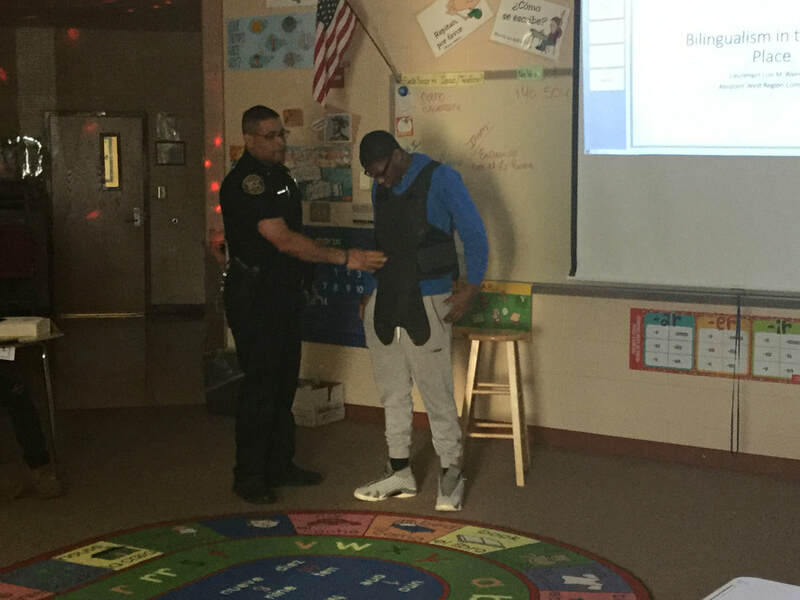 Dr. Spaulding states, "They’re enjoying it, and learning a lot and creating a lot of visuals to show understanding." 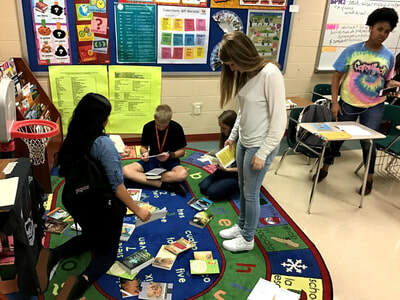 Mandy Domenech, immersion teacher at WKHS, has been encouraging students to read a book of their choice. She explains, "We are at the final half of our unit of Self Identity and have begun our individual reading of a Spanish language novel. 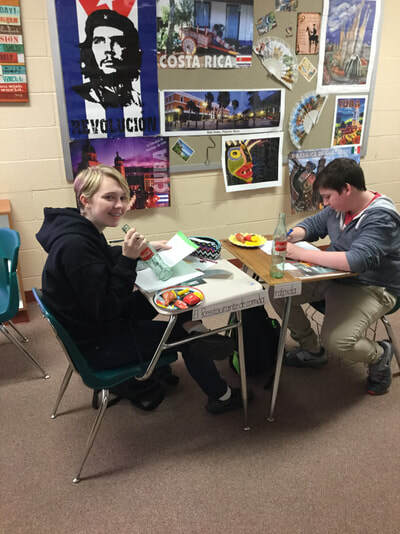 The photos below are of our “Book Tasting” of Spanish language young adult novels. They will use information gathered from sampling or “tasting” each book to decide which one they will choose for their independent reading of a novel. 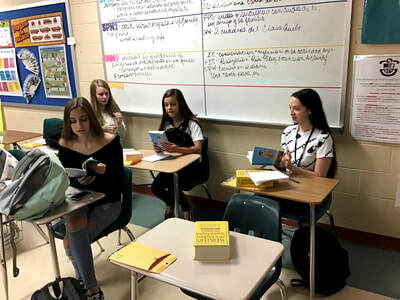 There will be vocabulary and grammar lessons pulled from what they read as well as interpersonal conversations and presentations (both written and spoken) based on the books they have chosen." What a personalized approach to language and literacy instruction! It is hard to believe we are approaching the end of 2017-18! This year has been very busy and we have learned and grown a lot together. As the year comes to a close our students will be taking the STAMP test. This online proficiency assessment allows us to see how our students are doing in 4 communication skills, reading, listening, writing and speaking. This is not a test where students have to memorize facts or study for it per se. 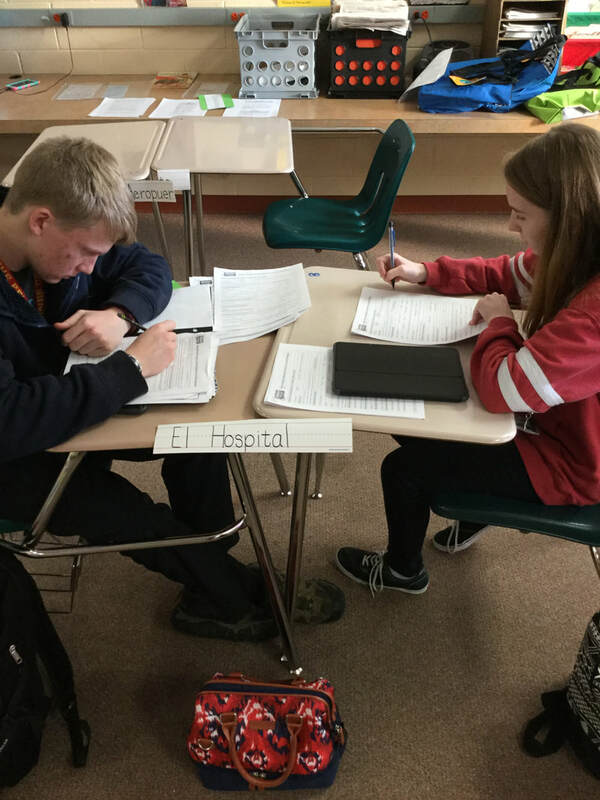 This assessment is interactive and students respond to prompts in a communicative manner, using skills they have learned throughout the year. This assessment helps us track how well we are progressing towards our language goals and also helps us in assuring rater reliability with our teachers. The more language your child can use, the more details they can provide and the more they can share information, the higher they will rate. Please encourage your child to show what they know! 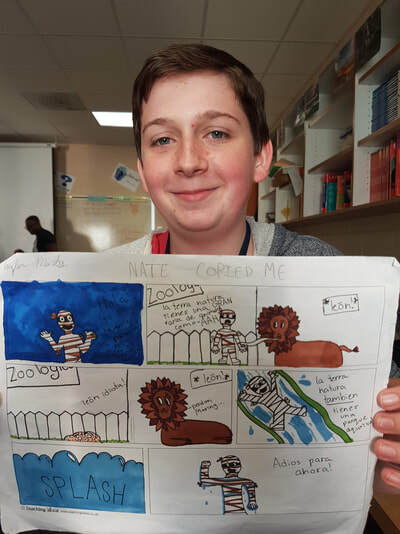 We sometimes find that our immersion students are so “to the point” getting across a message, that they don’t show how well they are capable of communicating and describing. For example, when you ask your child about their day, do they ever say “fine” or “okay” instead of giving you lots of detail about their day? We find that they sometimes respond very effectively and to the point, which is okay in some cases, but this type of response will not show their true ability to communicate in another language on this assessment. We know they can do SO MUCH, but we need to them to use lots of details and expand their thinking when they respond! We wish everyone good luck!! We know they will do great! Registration is still open for rising 5 year old kindergartners to register for kindergarten and immersion in Lexington One! Please be sure to visit our registration page for more information! Parent information sessions were held in February. If you are interested in learning more about the registration process or have questions you can check out the information below, or contact the registrar, Harriet Cotterman, at hcotterman@lexington1.net . CLICK HERE FOR THE PARENT BROCHURE! CLICK HERE TO REACH MORE DETAILED INFORMATION ON DUAL LANGUAGE IMMERSION REGISTRATION! As we are nearing the end of the year, parents of middle school students will receive a letter, notifying you of your child’s current status in their course and what their projected placement will be for next year based on this year’s performance. Their final ratings will convert to numerical grades at the end of the year. The conversion scale can be found here. If you have questions about your child’s performance in class, or placement for next year please feel free to contact your teacher or reach out to us at central services (Dawn Samples dsamples@lexington1.net or Ryan Pool rtpool@lexington1.net). We will be happy to help! As we are preparing for our rising senior immersion classes, we are planning to recognize them as immersion graduates! It is hard to believe they are graduating! We will be sharing more information with you soon as our plans are coming together. We are working together across sites to continue planning for experiences for our students outside the immersion classroom! We have students who will be traveling abroad this summer to Spain and France to study! We also are working to connect more with classrooms abroad so our students will be able to communicate with students in other countries to collaborate and learn together! If your child or your family is traveling abroad this summer or have exchanges or encounters with native speakers, please share your experience with us! 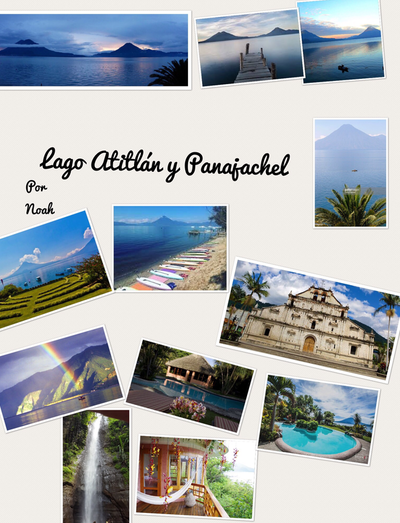 You can share your travel pics with us via twitter @LOWLT, #lex1worldlanguagesrock or with us on our Facebook page. If you want to share with us directly please email us (Dawn Samples dsamples@lexington1.net or Liza Speece, lspeece@lexington1.net.) We would love to share your summer language experiences! GPS: Sra. Sancho, 2nd grade immersion at GPS shared the following exciting activities. 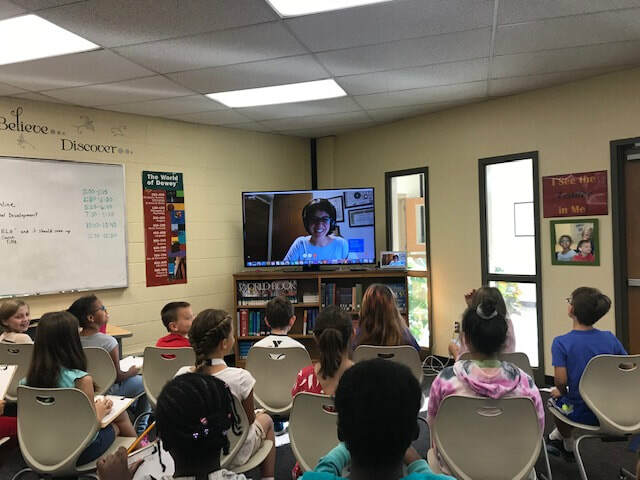 She says, "I did a skype conference with second graders from a Costa Rican school named Escuela Jenaro Bonilla, both countries' students were very excited and communicated fluently in Spanish. Each student got a chance to answer a question and ask a question about their schools, country celebrations, favorite subject, etc. It was an enriched cultural exchange activity, and also allowed my students to practice in a real life Spanish conversation. Another activity was during science Topic Matter: Solids, liquids, and gases. We made a mix of liquid and solids by making the recipe of a traditional sweet treat of my countries' culture named cajeta (a mix condensed milk and coconut flakes). It was an enriched science standard-cultural exchange that they truly enjoyed. 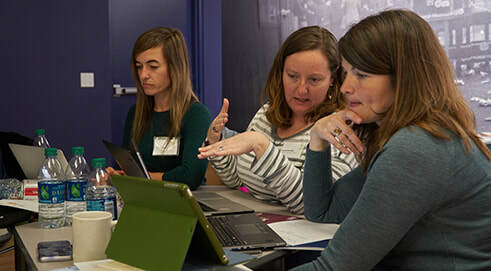 Our DES immersion teachers joined PASCH teachers from across the United States and Canada to attend a German and STEM workshop at the Goethe-Institut in Washington from March 23 to March 25. 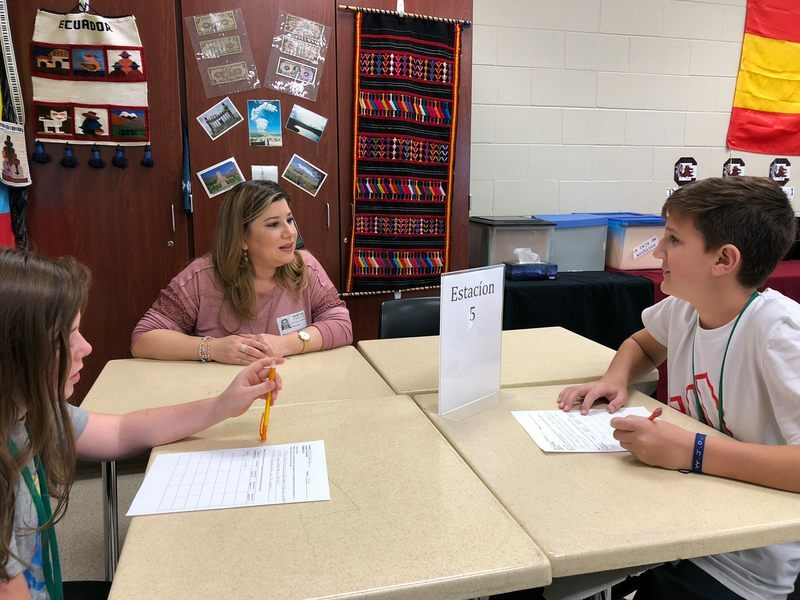 They brainstormed ways to integrate STEM disciplines such as math, physics, biology and chemistry into their German lessons and collaborate with their colleagues. Cheers to our team for being a part of such a strongly supported international organization--your work with PASCH helps our German immersion students receive excellent instruction each day. Click here to see the entire link. ​CSMS is planning an 8 day trip to the Dominican Republic in June 2018. They will travel across the Dominican Republic, a cultural journey into the local communities of the northern coast. Immersed in the local heritage, they will gain insight into the issues impacting children today. Working together with local non-profits and community members, students will build sustainable solutions to the educational, social and economic challenges they face. Immersion student A: "Does an applicant have an advantage for getting a job if they speak another language?" Lieutenant: "Yes. When we receive applications, we separate them into qualified candidates and unqualified candidates. For those who are qualified, we begin to rank them, and for those who speak Spanish, we move them to the top of the list. In fact, for those who speak Spanish, and also read Spanish, that's great. But those who can speak, read and write, that's even better!" 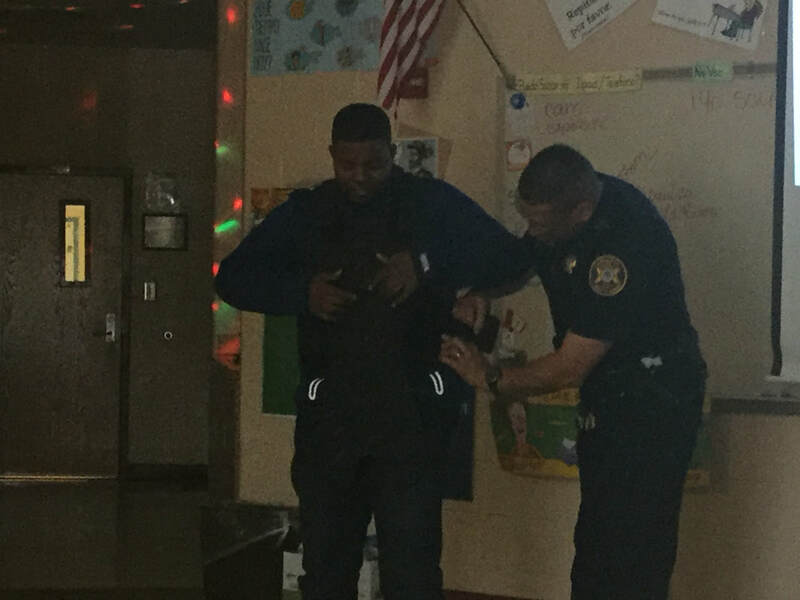 I interrupted here, "Can you please repeat that and share it with every student in every school!?!" Sometimes kids don't believe us because we're just their parents or just their teachers. But when an assistant commander of a local police force comes and speaks in Spanish to your students and tells them that they have an advantage...it makes a little bit more of an impact. Kudos to Sra. Domenech for emphasizing the usefulness of bilingualism in the workforce to all of her students. LHS is planning an 11 day trip to Málaga, Spain during the summer of 2019. Contact Ms. Latham at jlatham@lexington1.net for more information. Its our registration time of year! Please tell your friends and neighbors! ​There will be 5 parent information sessions you may choose from to attend. All information presented will be the same at each one. FEBRUARY 23, 2018 AT 9:00 A.M. AND 1:00 P.M.
FEBRUARY 26, 2018 AT 2:00 P.M. AND 6:30 P.M.
MARCH 5, 2018 AT 10:00 A.M.
DUAL LANGUAGE IMMERSION REGISTRATION WILL OPEN ONLINE ONLY ON MARCH 7, 2018 AT 4:00 P.M.
Parents should go ahead and enroll their child for 5K at the school they are zoned for prior to registering for immersion. If your child is admitted into the program we will transfer your child's registration documents to the school he/she will attend in immersion. As we are entering the second half of the year, its important for our immersion parents of middle schoolers to really encourage your child to do their very best in their immersion language arts and passport classes. As your child's teacher has shared with you, our middle schoolers are very capable communicators in the language and they are beginning to earn high school credits based on their performance in the language starting in 6th grade with level 1, 7th grade with level 2 and 8th grade with level 3. Their final ratings will convert to numerical grades at the end of the year. The conversion scale can be found here. Many of our middle school immersion students are absolutely blowing us away with their language skills! It is amazing! These students are more than capable of performing quite well at these levels (as their language data shows coming out of 5th grade), unfortunately we are finding that some of our students are often not taking the classes very seriously and applying themselves because they believe it does not "count" for anything. Nothing could be further from the truth! This is a golden opportunity for them to learn and grow in the language and begin earning credits while in middle school. 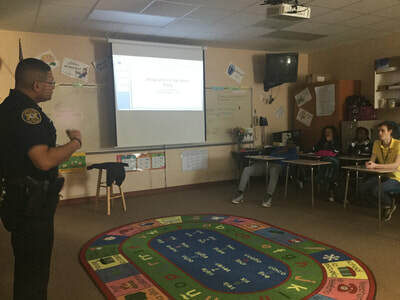 These classes DO count as part of their GPA at the end of the year and will be an important part of their middle school coursework as they prepare for high school. Please stress the importance of them applying themselves and paying attention in class so they can show what they really can do in the language and have a successful year! Our middle school teachers are willing and ready to assist them in order to ensure their success! NOTE: We are also planning on how we will be recognizing the accomplishments of our immersion students, our first graduates of our program in the district! How exciting! At RBES, Fourth grade immersion teacher Sra. Amundaray, just wrapped up a unit in which students worked with food and supermarkets: converting measurement in the customary system, doing line graphs, pie charts and line plots and collecting data through surveys. They made presentations to their classmates about their findings and shared some of the recipes they worked with. Parents were completely involved. What a great way to incorporate math into the real world, while also expanding L2 vocabulary! 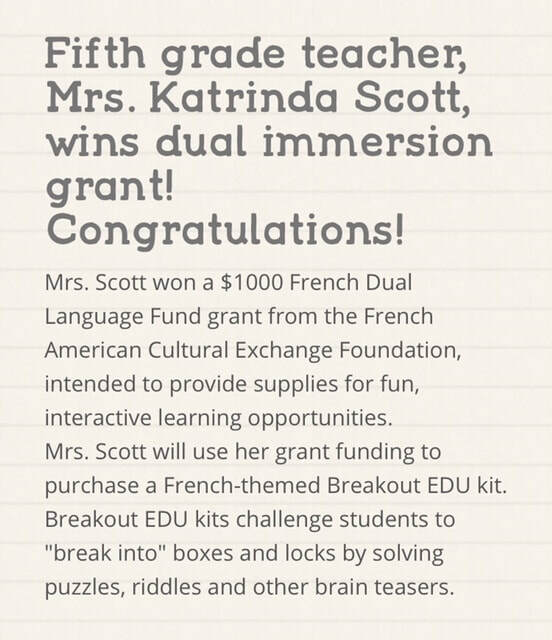 Another notable accomplishment comes from Katrinda Scott at MES. Have you ever made a rubber band ball out of 100 rubber bands? Or possibly a fruit loop necklace with 100 fruit loops? PHES Spanish Immersion Kindergarten students celebrated the 100th day of school by presenting to parents in Spanish, projects they created in Srta. Hood's class. Their creative and fun projects were a great excuse to practice counting to 100 in Spanish! MGES Chinese immersion students and teachers presented an incredible showcase for Chinese New Year. The entire school came together, art, music, P.E. administration, teachers and parents to celebrate Chinese New Year in style. Kindergarten performed a play, 1st graders danced in full costume, second grade sang, third grade sang, fourth grade did a Kung Fu style dance, and fifth grade did a dragon dance honoring the animals from the zodiac. Tai chi was performed, and one student played the violin. It was a beautiful celebration of language and culture. MGMS Chinese immersion students took a trip in December to the Confucius Institute at USC. Click here to check out the post on our WL blog. They also provided a wonderful learning opportunity in their building for all WL students about the celebration of the Chinese New Year. Here is a brief video of students in action at the celebration. At CSMS, eighth-grade Spanish immersion students recently tackled the Future Aspirations exploring different careers in which they can apply the World Language they have been learning for the last nine years. The students read 17 articles during these nine weeks about how to prepare to join the workforce. 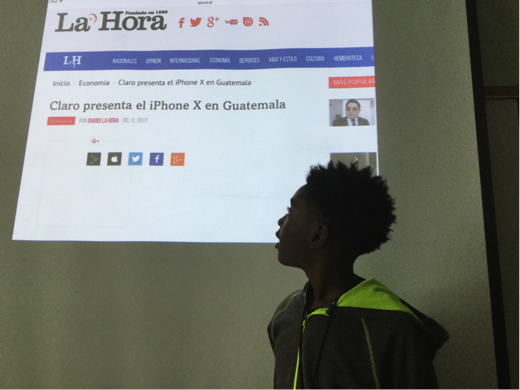 These items were read in the Target Language (Spanish) using the Program NewsELA; a website that rewrites news articles and other informational texts at five different reading levels to make it possible for students of all ages to read them. The students also watched some videos about careers from Discovery Education. When they had gathered enough information about the topic they were interested in, they created a video (in Spanish) trying to convince a friend to join the career with them. ​Year 1 immersion has extended our second unit of study, News, which focuses on accurately relating accounts in the past. Some of the activities to meet this goal have been: Research a local newspaper from one of the cities on their trip itinerary, and relate the news to classmates; watch a video of an unfortunate traveler, and write an account of what took place; tell a story of an unexpected event that took place during the trip to Spain. Students are showing much progress in terms of writing accuracy, and a beginning of integration of these concepts to verbal communication. 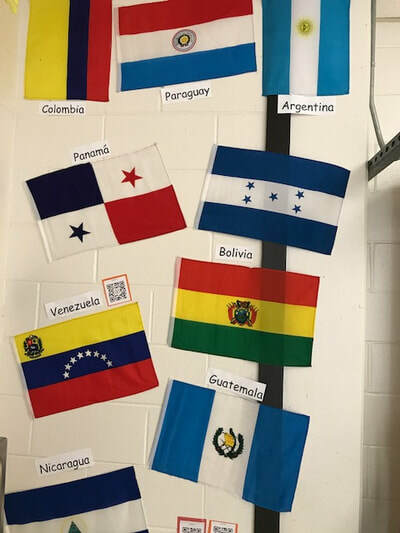 Year 2 immersion is diving head first into the topic of community challenges from various countries around the Spanish-speaking world. We educated ourselves on the sudden loss and slow re-building of the power grid situation in Puerto Rico. And we are now looking at the government collapse of Venezuela and its effects on daily life. However, we have moved away from simply reading about an issue to now building a sense of empathy for those in these types of crisis and imagining how our lives here in the U.S. would be interrupted by such events. A group of French immersion students will have the unique opportunity to study abroad in Angers, France during the month of July for 3 weeks. Click here to read tips from Jacquelyn, a multilingual high school senior who is passionate about learning languages. This bright young lady speaks Mandarin, English, French and Korean! As the time nears for parents to determine what language to choose for their child in immersion, perhaps some of the information shared in this article will help you make up your mind. Fortunately for us in Lexington, we are able to provide many different options for our parents and students! Click on the link in the title to read the full article. By Melanie Haber on Feb 1, 2018 at 4:37 p.m.
"Being bilingual is becoming a critical skill more employers are seeking. Having the ability to speak another language gives one a competitive edge against those who are monolingual, especially at companies with only monolingual employees. A survey conducted by the American Graduate School of International Management in Glendale, Ariz., found that a majority of students said that knowing another language was a crucial factor in getting hired. In 2010, there were 240,000 jobs that targeted bilingual workers. By 2015, there were 630,000 jobs. With such numbers on the rise, it is logical for one to conclude the need to learn a second language so they can succeed in the business world." It is hard to believe that the holidays are right around the corner! This fall has been so busy and our teachers and students have been working so hard and learning so much! Be sure to check out some of the great things we are doing in our classrooms! We hope everyone had a wonderful Thanksgiving and we wish everyone a very blessed and special holiday season! In our last update we shared with you how we had re-entered planning for dual enrollment with the University of South Carolina so that we can offer this opportunity for our immersion students in Lexington One. The College of Arts and Humanities and the Modern Languages department at USC have worked very hard with us to get this effort off the ground. We learned last week that despite our joint efforts and the proposal being approved at many levels along the way as it worked its way through the system, once the proposal reached the very upper-leadership levels at the university, it was not approved. We are all severely disappointed (yet again) that we were not able to get this in place for next year. In light of this latest news, we are working with our high schools to arrange for AP offerings for our students. We recognize that even though our students are capable of performing at higher levels, it would still allow them to earn some college credits immediately until we are able to offer more. We also have units of study we had proposed to USC that we can continue to work on and offer to our immersion students next year to supplement the AP curriculum and challenge our students. Please rest assured that we are continuing to have conversations with other post-secondary institutions and planning for dual enrollment opportunities with our world language and dual language colleagues in SC and beyond. We will keep you posted and updated on our progress. Immersion EDtalk for Secondary Immersion Parents! When? January 30, 9:00 a.m. to 11:00 a.m.
What? Overview of secondary immersion program and options to consider for language learning beyond the secondary classroom. RBES immersion teachers have been working hard this year to build school community around the immersion program and to raise awareness for Spanish language and the many different cultures that are represented in Spanish speaking countries. 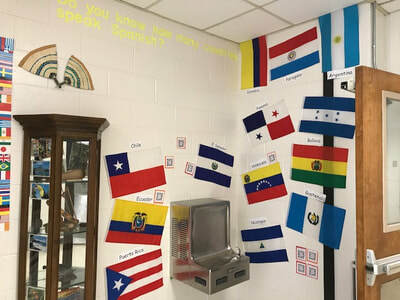 Recently, the second grade immersion L2 teacher, Mrs. Gutierrez, worked with her entire team and other school support staff to create a "Culture Corner" where all of the Spanish speaking countries are represented by their flags, along with a display of some items and pictures that are typical of some of the countries. They also found a video (in English) for each country and created and posted QR codes, so that any teacher in the school could bring their classes by to learn a little bit about where Spanish is spoken and the rich cultural heritage of their teachers and some of their fellow students and families. One of the most exciting things about our rich, diverse immersion programs, is the cultural enrichment for all of us who are involved. Being open to new cultures and diverse ways of thinking is one of the most useful life-skills we can teach ourselves and our children. Thank you for embracing this opportunity and for supporting our teachers and schools. 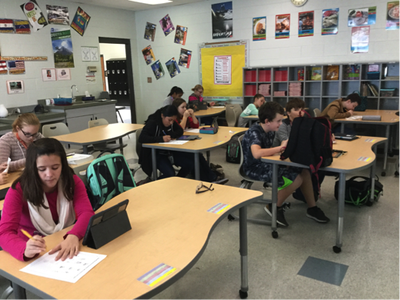 At GMS, sixth and seventh grade passport have begun research study on Guatemala. Students have been reading authentic Guatemalan newspapers and have reported back to the rest of the class as a formative activity; they will be ready to answer questions from classmates and/or teacher for their summative. Students have worked on specific sections every day. 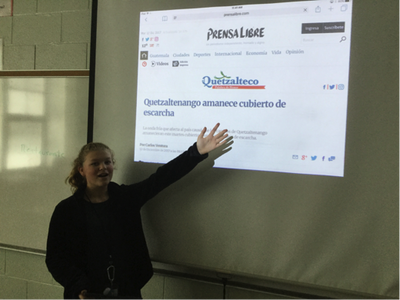 www.kiosko.net is the website students have used to find the Guatemalan newspaper. Students will continue learning about a few more topics on Guatemala, such as clothing traditions, chocolate, festive holidays and landmarks before concluding the unit. 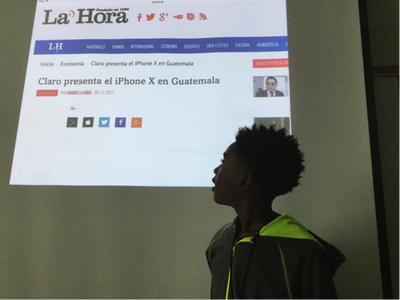 At CSMS, seventh and eighth graders are finishing the presentations for the Guatemala Unit. They researched, wrote an essay, created a KeyNote/Google Slide Presentation, built a model/diorama or cooked a dish for the class. Below are two of the topics that students chose to study. Our high school immersion teachers are getting creative with classroom space and set up. LHS got their benches for their outdoor classroom! Thanks to any of you who donated. They were able to get outside while the weather was still warm enough. WKHS immersion students enjoyed an Around the Town activity in which Sra. Domenech organized the entire classroom into stations representing the different parts of town students have been studying. At each station they had to use authentic text to accomplish a task in the L2. 1. How does language learning influence economic growth, cultural diplomacy, the productivity of future generations, and the fulfillment of all Americans? 2. What actions should the nation take to ensure excellence in all languages as well as international education and research, including how we may more effectively use current resources to advance language attainment? In response to this request, the Academy created the Commission on Language Learning. The Commission’s final report (published this year), America’s Languages: Investing in Language Learning for the 21st Century, offers concrete recommendations to improve access to as many languages as possible, for people of every age, ethnicity, and socioeconomic background. You can click the link to learn more and to download the PDF version of this report. Support for the Commission was provided by the Andrew W. Mellon Foundation, the Henry Luce Foundation, and resources from the Academy’s New Initiatives Fund. ​Fall is full of holidays like Dia de los muertos, Octoberfest, La Toussaint (All Saints Day), and the Moon Festival. While celebrations are not the extent of our cultural experiences, they do help us understand the practices and perspectives of other cultures! ​ Immersion News and Important Dates! Happy Fall everyone! This school year is already 1/4 of the way through! Students will be bringing home report cards this week! For middle and high school students, this means that your child will have a rating (between 1-20) for his/her language classes. Final numerical grades for high school courses will not convert from a rating to a numerical grade until the end of the course. 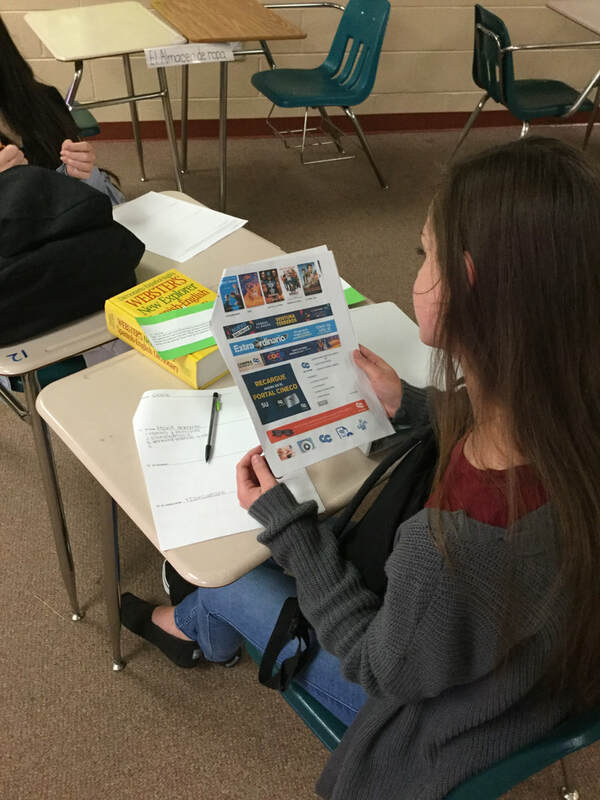 If you want to know more about how your child is rated on his/her proficiency in the language, be sure to check out the Grading and Assessment Guide for World Languages here! We are once again having conversations with the University of South Carolina about offering options to for a dual enrollment course at USC for our immersion students. We expect to have a written agreement in place with them in December. There will be more details coming soon once the agreement is finalized. If your child is a rising junior or senior and you are interested in this opportunity, please contact your assigned school counselor for more information. Here is some information your counselor will share with you. At MES, 5th grade immersion students are taking part in an exchange with a level 4 & 5 French class from LHS. Read our Voices From the Field blog for more info and pictures. 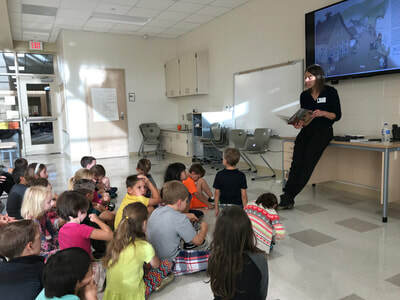 DES German immersion students celebrated German-American heritage week this month with a visit from Ankë Bar, German author and illustrator. You can see pictures below and view her website here. At PHMS immersion students have been selling “homemade” piñatas during lunch to raise money for victims of Hurricane Irma. Ms. Hughes says, "The students worked hard on these piñatas and were so eager to give back it was inspiring." 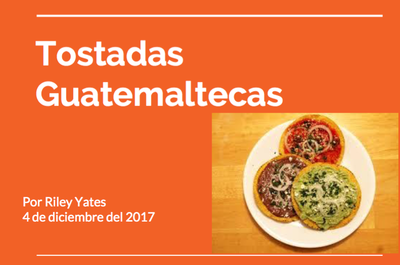 They will also celebrate Day of the Dead this week by eating the traditional bread eaten by our Spanish speaking countries of study. 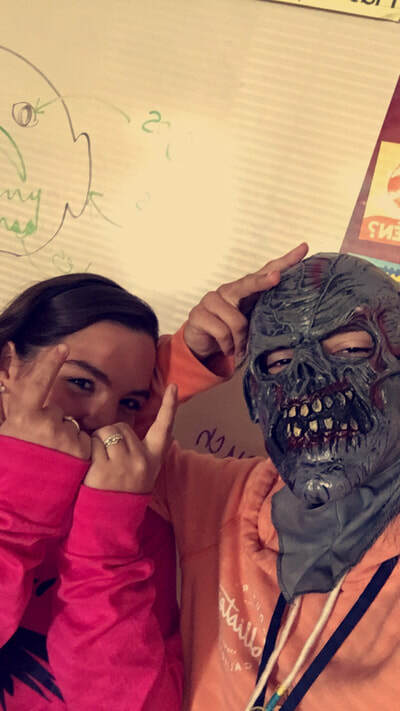 This month, WKHS immersion year 3 students wrapped up filming a Zombie movie just in time to conduct a mock UN conference discussing North Korea. (Talk about range and flexibility with language!) Each student was an ambassador to a different country and came prepared with their opening statement to deliver and ready to defend, negotiate, and collaborate their country’s stance on the issues regarding what to do about North Korea’s growing threat to the world. Year 2 students drafted a business letter to a company or organization to ask about their needs and offering their bilingual services. Year 1 students have been working on planning an imaginary trip to Spain (hopefully it will become reality one day.) As a fun October twist, they created comic strip stories about a monster visiting one of the attractions in the region of Spain they are researching. Why Global and Cultural Competencies Matter -Celebrating International Education Week (IEW)! The Department of Education — in collaboration with the Title VI National and Language Resource Centers for international and foreign language education at The George Washington University, Georgetown University and Howard University — are holding a workshop for K-12 teachers and administrators wishing to help their students develop the global and cultural competencies critical for success in the 21st century. The workshop will take place on Monday, November 13th, 1:00-4:00pm, at the U.S. Department of Education, 400 Maryland Avenue, S.W., Washington, DC. International Education Week (IEW), November 13-17, 2017, is an opportunity to celebrate the benefits of international education and exchange worldwide. This joint initiative of the U.S. Department of Education and the U.S. Department of State is part of our efforts to promote programs that help U.S. students and teachers develop the language skills and global competencies critical for success in the 21st century. Immersion News and Important Dates! Immersion students and teachers have hit the ground running this year! We have all been working hard to prepare for your child this year in many ways. We are offering support to our teachers through coaching, workshops and individualized support (personal and professional) in all of our programs. We are also working collaboratively with our human resources department to continue recruiting for teachers (this is always ongoing) and to support those who are new to our district - and country. Our new teachers are still learning about their schools and curriculum, the community and trying to get settled into their homes. Our new international staff are also learning to work in American schools and to live in an American community, which is quite different for many of them than the school and community setting they come from. Please encourage your child to be curious about their teacher and where they are from and what life is like for them! 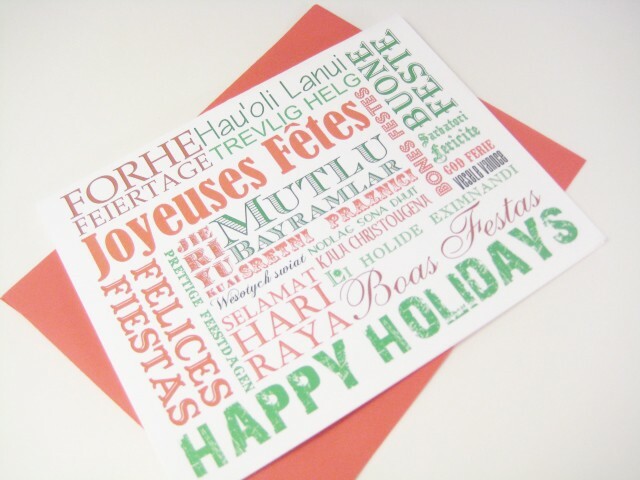 Our world language staff have lived and worked in communities all over the world! They can help bring new perspectives to learning and problem-solving to our daily lives! We are continuing to work with post-secondary institutions to provide dual-credit options for our immersion learners at high school. We hope to have some exciting news in the coming weeks to share with everyone! Many of our staff and students have family in the islands, in Florida and in Mexico. We would like to extend our deepest thoughts to all of those in our schools and community who have been impacted directly or indirectly through friends and family by recent events. Several of our schools and community members have been very supportive of these devastated areas by sending resources and materials to the locations who have been hit hard. THANK YOU for so much for your support! This year we will be offering some immersion informational sessions for elementary and secondary parents who want to learn more about how to support your child in immersion and about events and learning opportunities for your child through our immersion program! Secondary date coming soon! Who? Parents who are new to immersion or who want to learn more about how to support your child in immersion. This month from our Elementary Immersion Program, we highlight an important piece of advice coming from GPS K, "The best investment you can make in your child’s academic success is to spend time reading to him or her. Just 15 minutes each evening will make a difference. Reading together enhances your relationship, your child’s awareness of the world, conversation skills, reading comprehension, and writing ability." The stronger your child's literacy skills are in the L1 (first language), the stronger his or her literacy skills will be in the L2 (second language). From Middle School Immersion, big news is that MGMS now is home to two immersion programs, both French and Mandarin! The Moon Festival is coming soon and Mandarin immersion 6th graders are planning to study the origins and legends about this traditional festival, and more excitingly they are planning to make moon cakes. And in High School Immersion, at LHS, RBHS and WKHS we have three groups of immersion students. They all follow the same basic curriculum, but they are personalized for students and paced for the language and culture being explored. Year 1 students (9th graders) are currently exploring the first unit: A Summer Abroad with the essential question: How does proficiency in the target language broaden and enrich experiences in other countries? Year 2 students (10th graders) are exploring the theme of A Personal Journey: How do where I live and the surrounding culture influence how I deal with personal issues? Year 3 students at LHS (11th graders) are embarking on a study of Global Communities: What goals do international communities have in common? We have begun with a look at the UN and its role in global issues. ...that there is a strong link between U.S. national security and learning a foreign language? Recently a panel of experts convened at Georgetown University to discuss this very real issue, and the lack of emphasis Americans tend to place on world languages as compared to the rest of the world. When asked, "Why is language important in American foreign policy?" 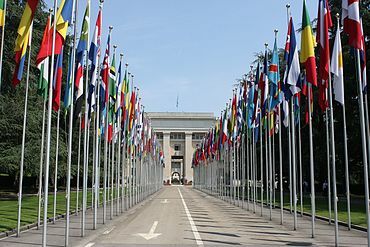 Esther Brimmer, foreign relations expert, asserts that speaking other languages builds our capacity to engage internationally, to attend to humanitarian and human rights crises, and to influence ideas affecting foreign policy. Furthermore, in response to the role of foreign languages in national defense, Michael Nugent, Director of the Defense Language and National Security Education Office adds, "When we’re engaging, regardless of mission, whether it’s a natural disaster in Haiti, or any kind of thing, DOD tends to be the first on the ground with equipment and other things. By having those language capabilities and having regional experts in those areas trained in advance to work those regions, we do much better in meeting mission, but we also do much better in developing partnerships. It is also important to understand the culture and the region in which they’re working. That’s the only way you can really build good partnerships." Simply stated, by learning foreign languages, we improve our ability to build relationships, build partnerships and understand other cultures. Marty Abbott, Executive Director of the American Council on the Teaching of Foreign Languages states, “I think that largely there’s an interest on the part of the general public in learning other languages, but it’s our national mentality that really prevents us from opening up to the experience, not to mention the fact that there’s a perception that the rest of the world speaks English.” When asked how to reverse this situation, Abbot responded: "We need to start early and stay long. We often say we need to make sure that languages are included in the school curricula just the way math is. If you told a parent, oh, your child isn’t going to start learning math until eighth grade, I think we’d have a revolution on our hands." And when asked why building a strong language program is so difficult in American schools, she points to bad teaching that happened in the past. But times have changed! In Lexington One, with our immersion programs and our emphasis on language as core in middle school, our students are graduating with real language proficiency, the ability to communicate and therefore build relationships and partnerships that might one day affect our national security. 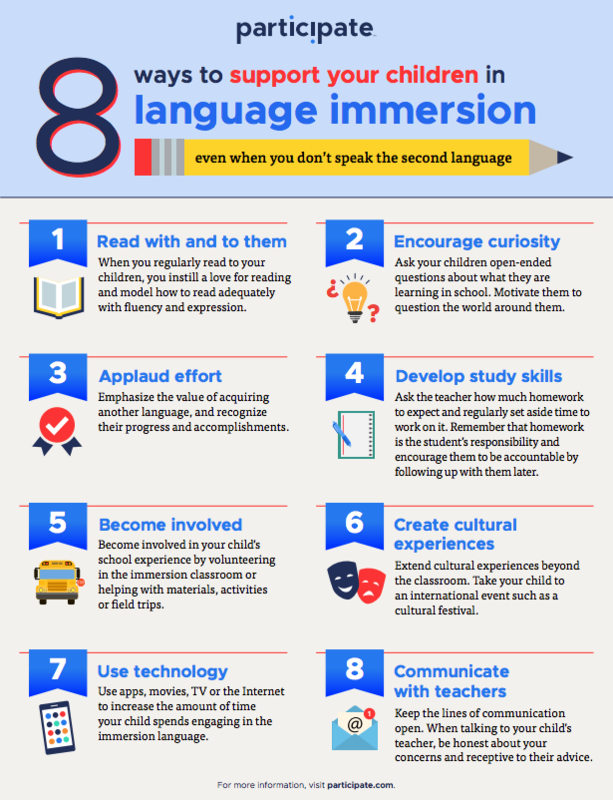 I'd say those are some great reasons to learn another language. How about you? For a link to the complete transcript of the panel discussion, click here. As the school year begins we would like to welcome you and your immersion language learners back into our classrooms! This year we will be sharing important immersion program updates with you around each marking period through this blog. Your schools and teachers will also be posting updates and sharing news with you through newsletters this year. This year our first group of immersion students (French and Spanish) are in 11th grade at Lexington High, White Knoll High and River Bluff High Schools! We are excited that we such a diverse immersion team this year! We have immersion teachers in our elementary and secondary classrooms from many different countries around the world! 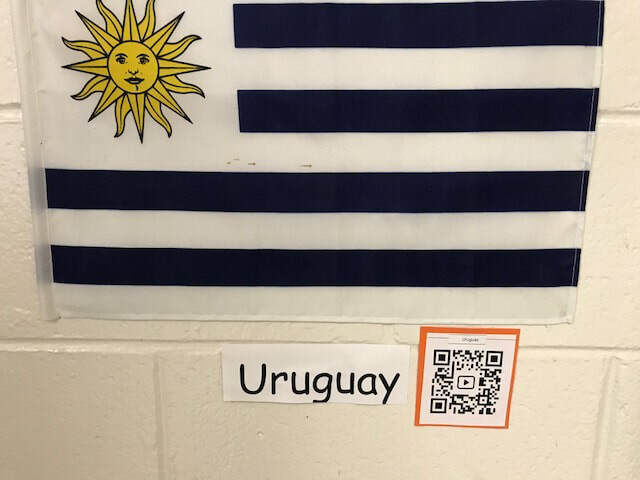 These countries and regions include French West Africa, Germany, France, China, Puerto Rico, Venezuela, Colombia, Honduras, Cuba, Costa Rica, Panama, Canada, and Uruguay! We would like to thank you so much for trusting us with your children's education. We are thrilled that Lexington One supports learning opportunities that provide rich experiences and critical skills to our learners through this program! We hope you have an amazing 2017-18 school year!